Successfully Added UHANS U100 Android 5.1 Smartphone - 4G, Dual SIM, 4.7 Inch Screen, 2GB RAM, MTK6735, Smart Wake, Motion Control, Gesture Sensing to your Shopping Cart. Combining form and function the UHANS U100 Smartphone will appeal the design conscious Smartphone users who are looking for something more than a plastic rectangular phone. 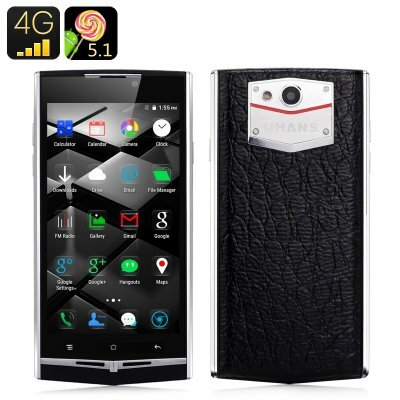 It looks like a luxury brand Vertu phone but its affordable price makes it available to all. The cowhide leather rear is a beautiful touch and is sure to get people's attention while the brushed metal sides and angular front make it stand out as an up market phone of action. Adopting a 4.7 inch screen with 1280x720 resolutions ensures easy one handed use much like the earlier iPhones. The UHANS U100 is powered by a MediaTek MTK6735 quad core CPU that boast a Mali-720 GPU for enhanced gaming and with 2GB or RAM its more than capable of running your favorite Android apps or brining lush movie viewing and seamless gaming. With an Android 5.1 OS interface you get all the stock android goodness but you can also enjoy features such as smart wake, gesture sensing, smart motion and three finger screen shots. All these combine to bring effortless short cuts for opening your favorite apps, scrolling though photos or answering a call at the flick of a wrist. With 16GB of internal storage and micro SD card support for an addition 32GB of space you can easily keep you music library favorite films and a full host of games and apps on this premium phone. When it comes to keeping connected the U100 has two SIM card slots that both support a range of frequencies covering 2g, 3G and 4G bandwidths. This allows for you to use multiple SIM card in the phone and brings great optimization and organizational benefits when managing business and work contacts. With its premium looks and generous price tag the U100 will suite anyone who longs for the luxuries like Channel or Gucci but who doesn't want to part with the sort of cash a Vertu phone goes for. The UHANS U100 4G Android Smartphone comes with a 12 months warranty, brought to you by the leader in electronic devices as well as wholesale Android Phones..